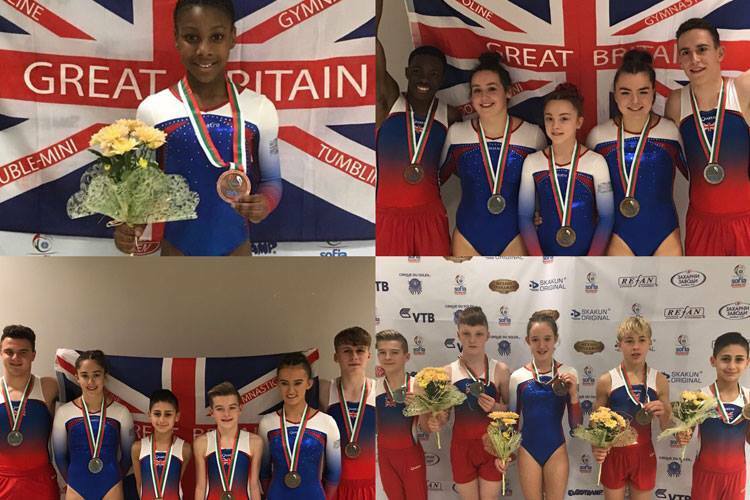 There was gold, two silver and a bronze for Great Britain on the second day of finals at the 2017 trampoline, tumbling and double mini trampoline World Championships in Sofia. 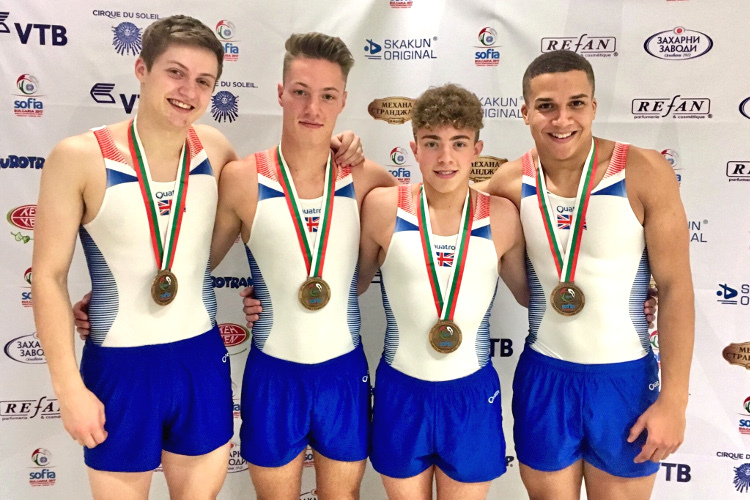 Our men’s tumbling team, Kristof Willerton, Greg Townley, Elliott Browne and Kallum Mulhall won the team World title with a faultless performance. 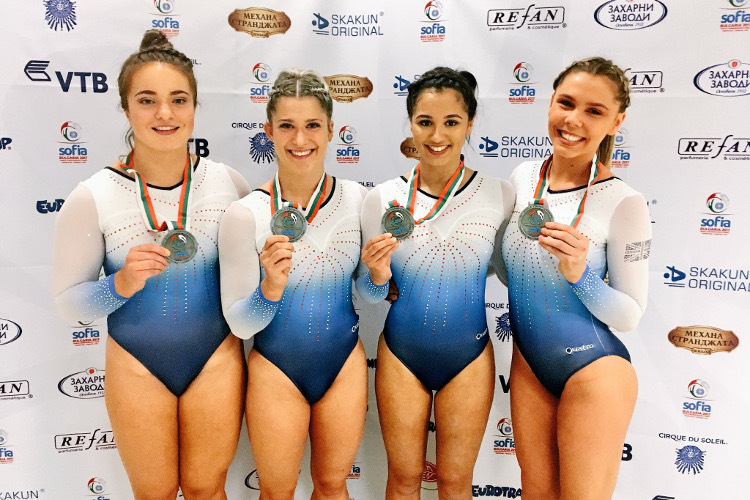 The team competed three routines in the high-pressure final and each was executed superbly to outclass the opposition and score 112.500 points for gold ahead of China and Denmark. The British women’s DMT team won superb silver in their final which was full of drama with a judging review declaring the final standings. 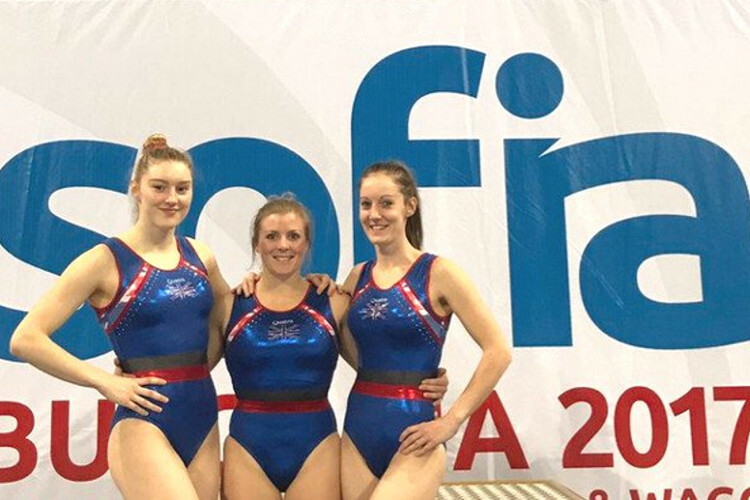 Kirsty Way, Phoebe Williams, Kim Beattie and Bethany Williams scored 102.200 points for the silver with Russia champions and Portugal in bronze. Nathan Bailey and Luke Strong produced a brilliant routine in the men’s synchronized trampoline final for silver. With others falling before them they kept their composure well and fought to stay in synch ending their routine in harmony for a score of 52.250 points to take the second spot on the podium behind Belarus 2 and ahead of Russia. And tumbling star Lucie Colebeck also won individual bronze with two superb tumbling passes in a closely fought final. Lucie scored 71.500 points to take third spot behind Fangfang of China in gold and Korobeinikova of Russia in silver. Elsewhere Andrew Houston placed 7th in the men’s DMT final scoring 31.800 and 24.800 for his two passes. 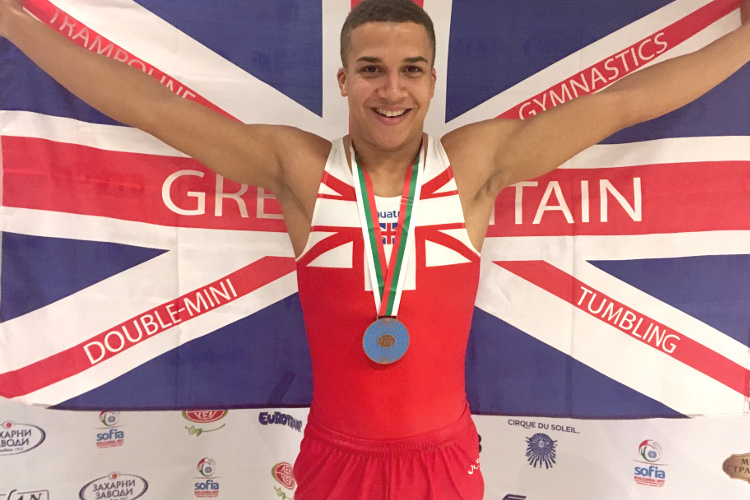 Tumbling team gold - Greg Townley got the British men off to a superb start in the tumbling team final with an excellent opening pass scoring 37.300 points. Elliott Browne produced an incredible tumbling pass to keep GB in the medal hunt second up, his huge smile on nailing his final twisting skill showed how happy he was, the judges rewarding it with a score of 37.600. Last up was Kristof Willerton knowing that a good routine would secure a medal and maybe the gold. He used all of his experience and produced when it mattered with a brilliant pass scoring 37.600 to give the team unbeatable team total of 112.500. Synchro trampoline silver- Nathan Bailey and Luke Strong were our sole competitors in the synchronized trampoline events at this World Championships. They qualified in to the final in 4th spot and took it up another level with their superb routines under pressure scoring 52.250 for the silver medal. DMT team silver- The team finals involve three gymnasts competing per country with every score counting to the total. In the women’s team double mini trampoline final Kim Beattie got the British girls off to a great start with her accurate pass, she stuck her landing to big cheers from her teammates in the crowd to score her 34.900. Phoebe Williams next up was judged to have hit the side of the DMT on her mount which gave her a zero score. Kirsty Way then completed her pass well scoring 34.700 points to give the team a total of 69.600 marks for 5th place…that was until the British team asked the judges to review Phoebe’s score. What followed then was high drama as the arena waited for the decision of the review whilst the judges closely re-watched Phoebe’s routine. Their conclusion - much to the delight of the watching British gymnasts - was that it was a legal pass worthy of 32.600 points to give Britain the silver medal. Tumbling individual bronze- Lucie Colebeck, having won tumbling team silver yesterday, was again in action this time in the individual final. Lucie was the first gymnast to compete and set the target with a superb tumbling run, she looked to the sky and had a big sigh of relief on sticking her landing for an impressive score of 36.100 points. 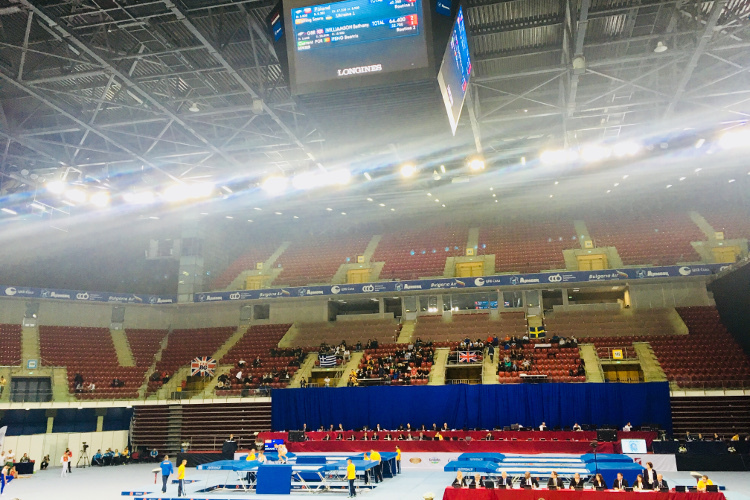 She took that energy in to her second twisting pass which was again well executed and again greeted with huge cheers from the crowd and an even bigger smile from a delighted gymnast, it scored her 35.400 for a total of 71.500 points. 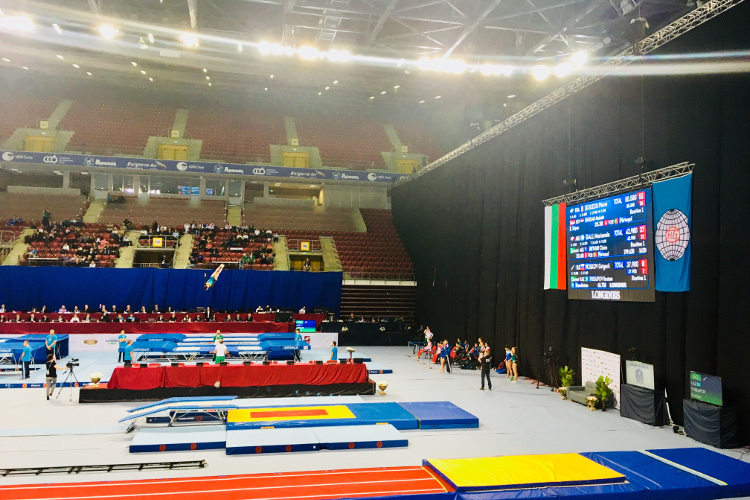 Sunday is the last day of the championships with British gymnasts competing in trampoline semifinals (and hopefully finals), the women’s DMT individual final (Kirsty Way) and individual men’s tumbling final (Kristof Willerton and Elliott Browne).